When you use gnome screenshot feature It was not able to save the screenshot on kali linux. 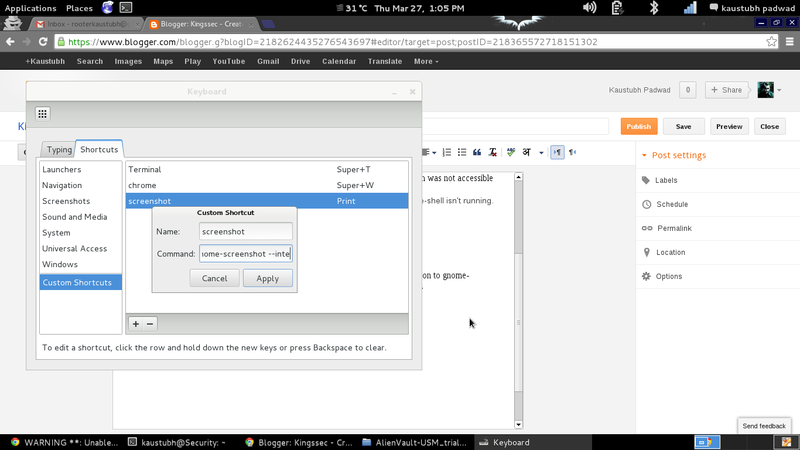 so its a bug in gnome-screenshot Latest version. So It was not unable to save the screenshot capture. gnome-screenshot can't connect to the shell service, that's expected since gnome-shell isn't running. The best recommended solution is to downgrade the gnome-screenshot to older version to gnome-screenshot_3.2.1-3_amd64.deb Google this to download and it will solve your issue. This one is i am using on my system. 1. Go to Application --> System-tools-->preferences-->System Setting--> Keyboard. Note:- 1. No need to downgrade for solution 2.